The term Kaluaokau can also be divided as ka-lua-o-Kau, which literally translates as ka (the) lua (pit) o (of) Kau (a personal name), or “the pit of Kau.” There are others. Whatever the purpose of the prior naming and its meaning, this portion of Waikīkī (including Helumoa, Kaluaokau and adjacent ‘ili) was important in the lives of the Hawaiian Ali’i. The first structure on the property was a simple grass hut; Lunalilo later built and referred to his Waikīkī home as the “Marine Residence;” it consisted of a residence, a detached cottage and outbuildings, surrounded by a fence. The estate included a small section that extended makai to the sea and included several small outbuildings and a canoe shed. Queen Emma had Papaʻenaʻena Heiau on the slopes of Diamond Head dismantled, and she used the rocks to build a fence to surround her Waikīkī estate. Later litigation confirmed that the Queen Emma parcel included access to the water (ʻĀpuakēhau Stream) and the taro growing on the ‘Marine Residence” property. Queen Emma is known to have resided occasionally on the Waikīkī property before her death. Her will stated that her lands be put in trust with the proceeds to benefit the Queen’s Hospital in Honolulu, which Queen Emma, along with her husband, Kamehameha IV, had helped to found. Records indicate Henry Macfarlane, an entrepreneur from New Zealand who had settled on O‘ahu owned and/or leased property within the Kaluaokau ʻili. Reportedly, it was Macfarlane and his wife who planted the banyan tree currently growing in the center of the property. They lived on this property for a while, eventually raising six children, some of who became financiers for sugar plantations and for the early tourist industry in Waikīkī. The site was also used by immigrant Japanese workers. During the construction of hotels (Moana Hotel, Royal Hawaiian Hotel) in the early twentieth century (and later the Surfrider in 1952) by the Matson Navigation Company, cottages were built for housing the mostly Japanese immigrant workers and their families, and called “Japanese Camps.” More buildings were built. By the mid-1950s, there were more than fifty hotels and apartments from the Kālia area to the Diamond Head end of Kapiʻolani Park. The Waikīkī population by the mid-1950s was not limited to transient tourists; it included 11,000 permanent residents, living in 4,000 single dwellings and apartment buildings. The International Market Place first opened in 1957. Envisioned as a commercial center with the Dagger Bar and Bazaar Buildings, and featuring the arts, crafts, entertainment and foods of Hawaiʻi’s multicultural people, it may have been one of the earliest cultural tourist attractions in the Islands. By the late-1950s, a row of retail shops had been constructed along Kalākaua Avenue. Other elements of the International Market Place included the Hawaiian Halau, Japanese Tea House and Esplanade buildings. The banyan tree, which still remains to this day, was also once home to Don’s tree house. Matson sold all of its Waikīkī hotel properties to the Sheraton Company in 1959 and no longer required housing for its hotel staff. Additionally, properties were likely cleared in anticipation of the extensive development that occurred throughout Waikīkī in the 1960s and 1970s. The famous Duke Kahanamoku’s (Duke’s,) where Don Ho gained fame, was once housed there. Don the Beachcomber, one of Waikīkī’s long-gone landmark restaurants, as well as Trader Vic’s also called it home. Hawaiʻi radio icon, Hal Lewis (the self-named “J Akuhead Pupule,” best known to Island radio listeners as “Aku,”) once broadcast his popular morning talk show from the tree house in the Banyan tree. However, over the last half-century, as the rest of Waikīkī evolved, the Market Place kept its 1960s look, as visitors wind through the carts and kiosks, hawking T-shirts, plastic hula skirts, volcano-shaped candles, and other tiki and tacky souvenirs. Landowner Queen Emma Foundation is looking to change that. Working with the Taubman Company, the International Market Place, Waikīkī Town Center and Miramar Hotel are destined for destruction, with new structures to take their place. Aiming to restore “a sense of Hawaiianness,” the new International Market Place will feature low-rise structures, open-air shops and restaurants, paths, gardens, a storytelling hearth, a performance amphitheater and, yes, parking. And the banyan tree stays. Today, as successor to The Queen’s Hospital, The Queen’s Medical Center is the largest private nonprofit hospital in Hawaiʻi, licensed to operate with 505 acute care beds and 28 sub-acute beds. As the leading medical referral center in the Pacific Basin, Queen’s has more than 3,500 employees and over 1,100 physicians on staff. The royal mission and vision of The Queen’s Health Systems is directly supported through revenues generated by the lands bequeathed by Queen Emma when she passed away in 1885, including the International Market Place. 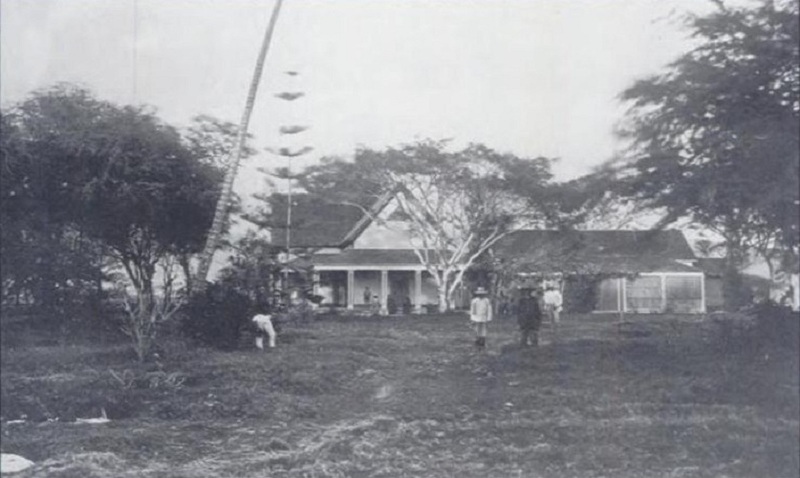 The image shows the Marine Residence of Lunalilo (and later Queen Emma) at Kaluaokau, now the site of the International Market Place. In addition, I have added other related images in a folder of like name in the Photos section on my Facebook and Google+ pages. It’s sad to see the Marketplace go. Hawaii magazine posted a proposed pic which would have a Saks Fifth Avenue there! Too many high end shops taking over Waikiki…taking away all the fun.